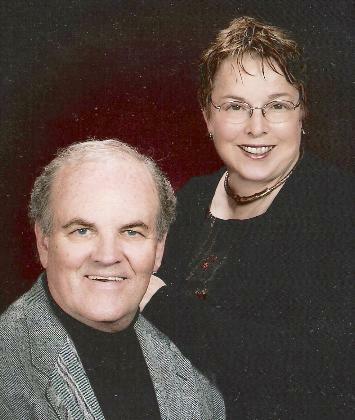 If you live in Florida or Illinois, or near either of these two locations, your next church function, clubhouse gathering, organization picnic, dinner theatre, or other special event is sure to be a hit when you invite Fred and Sharon Moore to entertain your guests. With their 50+ years of experience and their natural ability to completely captivate a crowd, Fred and Sharon will have your group laughing, singing, and having a fantastic time! Fred was a high school teacher in Downers Grove, Illinois for 33 years and retired in June of 1993. He taught Honors English, German, Radio and Television Production and Film Studies. He began Radio Station WDGC-FM and TV station CABLE 99 for the school district and remained general manager of operations for 27 years. He directed 27 musicals and 33 plays for the district and appeared in leading roles in several community productions himself, including Harold Hill in THE MUSIC MAN. Professor Henry Higgins in MY FAIR LADY and Sky Masterson in GUYS AND DOLLS. Sharon continues to serve in church music ministry and plays keyboard for many Programs Unlimited shows. Fred serves an ordained pastorate in Frostproof, FL. These activities have been an integral part of their life, and they now draw upon these resources to present interesting programs in Central Florida and the Midwest. They were married in 1957, have two children, eight grandchildren and a new great-granddaughter. Though they are on the road for many shows a year, their family is still the delight of their life.